My name is Marinka and this is my debut hosting the Alpha Mom Book Club. 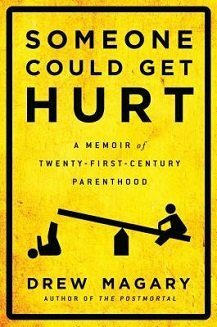 As you probably know, the first selection under my watch is Drew Magary’s Someone Could Get Hurt: A Memoir of Twenty-First-Century Parenthood. I love humor, memoirs and writing about parenting, so I picked it, hoping that this would be a light-hearted and good choice. And it was. Magary has a deft touch, writing about his life as a husband and dad of three young children, two of whom seem to have the all-too-familiar bouts of toddler Satanic possession. The youngest child had to have life-saving surgery shortly after birth that involved disembowelment, OMG. He refers to his children as “boy” and “girl”– keeping us at arm’s length and letting us feel that his children, and our own, are all members of the same tribe. Demanding at times, absolutely unreasonable and uncontrollable and unbearable (to list just a few “un”s), but also the source from which we draw breath. As parents, we are at their disposal, even though there are definite times (such as when our own parents are observing) when we need our progeny to bend to our wills and shut the hell up if for no other reason than to make us, the parents, not seem completely incompetent. Every parent has been there. We’ve all felt the need to save face. But it is possible that Magary has been there more than most. Or that he writes about it more candidly. There was a time that his daughter erupted during Gymboree class, drawing the attention and disapproval of the mothers of the other (well-behaved) children in the class. Or the time his daughter kept saying Faka to him and laughing maniacally. Or the time that his three year old son absolutely insisted on going to a pool designated for older kids, despite the lifeguard’s admonitions. And then peed in the corner, because of course he did. At his best, Magary voices what many parents have thought during their dark hours. When his infant daughter cries inconsolably in her crib, he thinks “Go ahead, shake that baby. Maybe shaking it gets all the tears out!” Personally, I don’t remember having that particular thought, but I certainly hoped my kids would just STFU at various points in their infancy. Not quiet the image of the Madonna cuddling her Gerber baby, all love and maternal patience, but I’m guessing it’s representative of the modern parenting experience. We are busy, we are exhausted, we want to sleep at night. It’s really not that much to ask. We are human beings, we have needs. It doesn’t mean that we don’t love our children, it just means that we need them to go to sleep/be quiet/stop torturing us. There’s a certain pleasure in reading about someone who had it worse. I thought that reading Someone Could Get Hurt would be a mixture of schadenfreude and recognition. And there are absolute elements of that, sure. As a parent of a 12 and a 15 year old, it was impossible to read the book and not remember both the “who can pretend to be more asleep” battles with their co-parent during the middle of the night feedings and the blind rage at designers who seem to have masterminded playgrounds for maximum frustration. It absolutely took me back to the days of scheming for some time away from the kids. Magary claims that “for every hour a mother gets to herself, a father will demand five times that amount for drinking with friends and acting like an immature dipshit.” And if that is true, and I suspect it may be, I wouldn’t be surprised if it were the basis for a new type of parenting revolution. Gender wage disparity is a fact of life in this county, and will be for a long time to come. But perhaps we can have more parity in the time-away-from-childcare department? Magary doesn’t shy away from his mistakes and unfortunately, some are hard to gloss over. There is the time that he is arrested for a DUI. “I loved the feeling of the car zooming along when I was buzzed,” he writes and although I am certain that it is unfortunately relatable to many, it is also horrifying. He admits to having a couple of drinks and driving with his wife in the car, and with his children. It was irresponsible, he admits but it “softened my temper when they were kicking my seat.” He drank at children’s birthday parties and playdates because alcohol made the stories of renovations that parents regale each other with go down easier. Because of his arrest, Magary’s license was suspended, leaving the entire burden of getting the family of then four around on his wife. “A parent that can’t drive isn’t a parent at all,” he states of his incapacity and that is certainly one way to look at it. On the other hand, a parent who can’t drive is head and shoulders above the one who drives drunk. Magary got lucky. No one got hurt as a result of his actions, so perhaps the levity around subject isn’t misplaced. But for me, it colored who he is. As parents, we childproof our children’s lives, look to avert the dangers around them, do our darnest to make sure they do not get hurt. Driving around intoxicated with them, goes against that grain. The question becomes, how can you be scared that your children will get hurt, if you’re in the driver’s seat? But maybe that’s what parenting is. Luck. Driving drunk did not hurt his children but the third child being born seven weeks premature, intestinal malrotation certainly did. Because that’s how life works, apparently. Having children means that you can’t control the pain, can’t predict it and often can’t stop it. For all the humor and the irreverence and the lice (start itching now), the longevity of the book is in the tenderness. When he and his daughter go for a long walk, when she plays Sleeping Beauty with him, and when he learns that his youngest son’s operation was a success. “Before this, I never knew that joy and misery could merge into a single emotion,” he writes, “that you could cry for ten-minute stretches while feeling simultaneously overjoyed and horrified.” Because joy and horror are pretty much what parenthood is about. Along with sleeplessness, of course. 1. As parents we’ve all had frustrating moments with our children, when we thought things that we probably would not share with the authorities, absent representation by counsel. Does Magary verbalizing those thoughts move the parenting narrative forward or is it shocking and upsetting to read such things? 2. Can you relate to Magary’s marital experience of pretending to be asleep so that the spouse can take care of the night feeding? 3. What did you think about Magary’s DUI and the way he wrote about it? Did he minimize what happened or did he learn his lesson? Does his use of humor in that chapter undermine the message or reinforce it? Also, join us again on May 12, 2014, when we discuss All Joy and No Fun by Jen Senior. We’re very excited to read this parenting book which examines the effects of children on their parents. Marinka lives in NYC with her two kids, a cat and a TV set. She’s the author of the humor blog, Marinka NYC and her writing has appeared in numerous publications, including the The Huffington Post, McSweeney’s, BlogHer.com, Babble and her diary. Together with her partners, Marinka created the popular @PaulRyanGosling Twitter meme. She has been selected BlogHer’s Voice of the Year, and has been named of the best humor bloggers (and human beings) by Babble in 2013. She is currently working on her memoir about immigrating to America, titled From Russia With Baggage. I haven’t read the book, but I can only imagine if a mother had confessed to driving her kids around drunk. At least the monthly “Should Moms Drink at Playgroup?” news segments make me think that. You’re absolutely right. If a mother had a chapter about drunk driving with her child in the car, it would had absolutely wagged the entire book and perhaps rightfully so.